Once upon a time there lived a woman named Judy who had just moved into the new home she had designed. It was situated near the cellar hole of the house where her father was born, and on the land her grandparents had bought in the 1920’s. The new home was partly made of material from the barn that she played in as a child. It was a very special place. It needed a special Christmas Stocking. The old “store bought” Christmas stocking just wouldn’t do. So she went in search of a pattern for the perfect Christmas stocking. Which she couldn’t find. Not that she knew what she was looking for; she didn’t. . . just that she would know it when she saw it. And so, later that year, Judy’s Colors showed the 2007 Christmas Stocking Collection. Little did she suspect that a little over two years later Vogue would show her designs in the Holiday issue of Vogue Knitting, but it really did happen. I wonder if she ever did create the perfect stocking for her new home. . . certainly she made many designs, had many more in the wings, and many more in her head . . . but has THE stocking for her home been knit? Judy lives and works outside of Farmington, Maine. A jack of all trades, (or shall we say Renaissance woman?) she has worked as a calligrapher, graphic designer, kitchen designer, garden designer, seamstress, secretary, knitting and needlepoint retail salesperson, and indoor plant store manager. 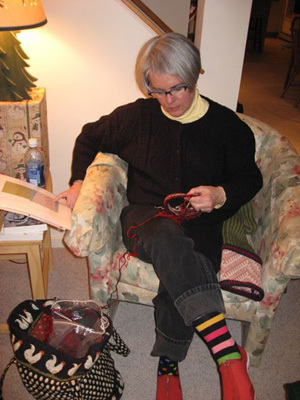 She has taught calligraphy, knitting and needlepoint. And has started far too many businesses!